Do you ever have trouble remembering the difference between dessert or desert? These two words are so similar that they are often confused, but there is a trick for keeping them straight. Just remember this: dessert has two S’s, because we always want more! So how can you add even more to your cotton candy desserts? Toppings! Get comfy and grab a snack, because this list is going to make your mouth water! Pop Rocks may be small, but they pack a punch and are just the thing to make your cotton candy pop (pun intended!). Though not well-known for their flavors or colors, they have a way of wowing crowds of all ages. Sprinkles most definitely fall into the fancy category. With a wide variety of shapes, sizes, colors, and designs, you are sure to find a sprinkle to complement any theme or party. 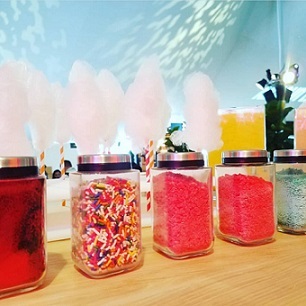 Light and easily transportable, sprinkles are a quick topping that won’t weigh down your cotton candy. Just picture little daisy flowers planted on a fluffy pink hill of cotton candy! 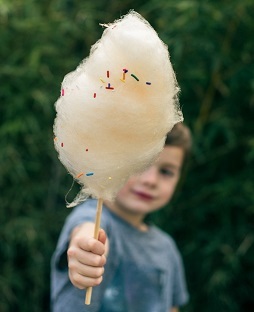 These little clumps of sugar can be a fun extra dose of sugar or an important part of your cotton candy’s visual design. Animals, flowers, letters…you can find almost any shape in stores or make them yourself at home. Who doesn’t love a little bit of chocolate? These shavings are perfect for giving your cotton candy just a hint of chocolate flavoring without having to worry about dealing with a melted mess. It is the perfect topping to give your cotton candy that regal air of an expensive French dessert. Graham Cracker is an exciting way to add a bit of crunch to your cotton candy and really give your customers something that they are not expecting. Cinnamon, chocolate, honey…there are many different flavors to choose from, making this topping versatile and delicious. Oreo is a classic topping for many desserts, and cotton candy is no exception. Its flavor is so recognizable and powerful that a little will go a long way in creating a taste they won’t soon forget. Everyone has a favorite cereal, but not everyone knows that you can eat it with more than milk! This is a great topping to add a little something fun and familiar, especially if you are spinning live. Just set up your booth, have a few different boxes of cereal, and let them choose one. Some of our favorites include Fruity Pebbles, crushed Cap’n Crunch, and crushed Cinnamon Toast Crunch. Sprinkle a little on top and your cotton candy will be as pretty as a caramel apple! Any kind of nut will work, or even a combination of a few. Sweet-n-sour fans this one is for you! These sour Jolly Ranchers are the perfect opposite to the sweet, sugary goodness of your cotton candy. Sweet-n-salty anyone? A bag of regular potato chips is all you need to achieve this taste bud civil war. A dash of chocolate makes everything taste better, but what makes mini M&M’s even better is the fun assortment of colors that they come in. Build a rainbow or sort them and use your favorite colors one at a time, either way these tiny candies will add some bright spots of color and start a party in your mouth. You will need a little bit of moisture to apply these to the cotton candy. Chocolate always has the slight danger of melting, but edible confetti is the perfect way around it. Get that same splash of colors without any chance of a mess. If your colors are bright and your flavors are already perfect, then edible glitter is an easy way to bring your cotton candy to the next level. Just a little bit of glitter will make sure your cotton candy shines! This topping is almost as light and fluffy as your cotton candy. Coconut will make a wonderful topping because it won’t flatten your cotton candy. It also is a flexible additive that blends nicely with a wide variety of flavors without overpowering them. One of the best kept secrets of the baking industry is powdered sugar. White and airy, it is the best way to add a light dusting of “snow” or make yourself a cotton candy ghost! Sugar and spice have been together for a long time. This spice is a common favorite, but be careful not to put in too much. Remember that with cinnamon, less is always more. Not happy with the color of your cotton candy? Color Mist Spray is an edible spray paint designed especially for baking. Though application can be a little tricky (don’t stand too close!) it is an easy way to add some colorful swirls, stripes, polka-dots, and more to make sure your cotton candy stands out from all of the rest. It is pretty much a guarantee that if you like something and you can crush it, then it will make an absolutely mouth-watering topping! Who said that toppings can’t be healthy? Freeze-dried fruit is an unexpected way to counteract the inevitable sugar-rush and convince yourself that you are eating healthy! An added topping can be just what you need to give your cotton candy that “more” that we always want with our dessert! Be creative and experiment with the many toppings you have to choose from. Don’t limit yourself to just one, try several or even combine some together. With such a wide assortment, you have a world of options that are sure to make your cotton candy fun, fancy, and flavorful! What are your favorite cotton candy toppings? Which toppings worked best for you? Let us know which toppings you used and send us a picture of your creations!